It seems obvious for February, I know! 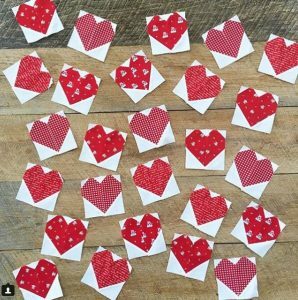 But we have never done heart blocks for the round robin and I kept seeing cute ones on my IG feed and couldn’t resist joining in. Please do two sides, 5″ to 6″ wide. Whether they are adjacent or parallel to the centre block is up to you. A reminder that my prompts are just that, and you have creative licence to do what you think works best for the top you’ve received.